In a series of legal battles concerning the mining industry in Greece, the latest development touches upon the EU constitutional order of the internal market. The CJEU in the Ellinikos Chrysos v Commission (C-100/16 P) ruling of early March 2017, ordered the mining company, Ellinikos Chrysos (Greek Gold) to return to the Greek state the acquired illegal state aid of € 15.34 million. The case concerns an investment at the Kassandra mines in Skouries, Halkidiki, in Northern Greece, and is of great relevance not only for the internal market itself, but also for Greece and the Netherlands. The activities of Ellinikos Chrysos in Northern Greece have been at the centre of a scandal involving among other things national law, ecological destruction, and human rights. 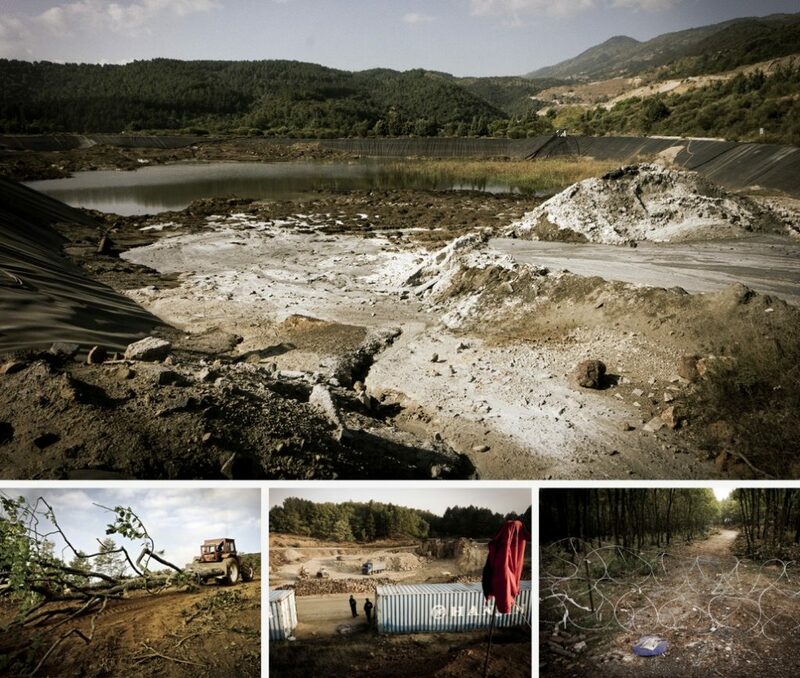 The extraction activities of copper and gold at the Kassandra mines in Skouries have met with repetitive challenges to their legal permits, especially concerning irregularities in the environmental approval, while they have already caused and continue to cause the ecological destruction of a vast region. This concerns heavy metal pollution, soil erosion, loss of biodiversity, along with massive deforestation including large parts of ancient woodland. The consequences for the environment, the livelihood, and the safety of the local community have led to strong opposition especially from the residents of the villages most affected, Megali Panagia, Gomati, Palaiochori, and Ierissos. The protests have been met with violent repression from the police and such extreme criminal persecution that it has caught the attention of Amnesty International and influential figures in the international environmental movement, such as Naomi Klein. The investment has had the support of all Greek governments up to 2015, but also of local authorities. Currently a donation of € 11 million by Ellinikos Chrysos to local municipal authorities is under investigation by the Greek courts. Ellinikos Chrysos is a subsidiary company of the Canadian enterprise Eldorado Gold, which operates through Dutch mailbox companies.  In 2015 The Centre for Research on Multinational Corporations (SOMO) published a report, entitled Fool’s Gold covering the environmental, humanitarian and economic impact of the activities of Eldorado Gold in Greece. The report also studies the profit shifting scheme through the Netherlands and explains how the company routes interest payments from Greece to Barbados via the Netherlands. Facilitated by loose tax legislation in the Netherlands, Eldorado Gold owns at least 12 mailbox companies in Amsterdam with a total asset value of around € 2 billion. The related losses in tax revenue for Greece are calculated by SOMO at € 2.5 million for 2012 and 2013 alone. The transactions of the Greek state with the mining industry have been found by the CJEU to constitute illegal state aid, which disrupted the regular functioning of the internal market. The background story goes back 30 years, but in 2001 the local community challenged the environmental permits of the predecessor company TVX Gold. The Greek Council of State cancelled the permits and the company filed for bankruptcy. In 2003 an extra-judicial settlement was reached with the state, through which the Greek state purchased all of the company’s assets for € 11 million. Furthermore, the company and its directors were relieved of any civil, criminal, and environmental liability. Finally, the settlement disallowed any claims of the Greek social security funds for the debts of the company. Immediately afterwards the mines were sold to a new company, Ellinikos Chrysos, which was set up only three days before the contract was signed. They were sold for exactly the same price of € 11 million, which made this a symbolic transaction with no profit for the state. On top of that, the transaction was tax free. The contract exempted Ellinikos Chrysos from transfer tax and any other tax, while it relieved the company in advance of any future claims for environmental or third party damages resulting from the past operation of the mines. Another exemption came with an amendment to the Greek Mining Code at that time (Article 102) which granted mining companies full possession of the minerals contained in the granted concessions, without paying any royalties for their depletion. The law has now been changed taking effect as of 2013. In 2007 the Commission received a complaint challenging this property transfer as illegal state aid (Article 107 TFEU). The Commission decided in 2011 under Article 108(2) TFEU that the transfer, which was at a price below real market value, and the exemption from the transfer taxes constitutes illegal state aid, incompatible with the internal market. The DG for Competition ordered the Greek state to re-establish the previously existing situation by recovering the total amount (€ 14 million to reach market value and € 1.34 million in waived taxes) plus interest. The Greek State and Ellinikos Chrysos brought an action challenging the Commission’s decision and the General Court dismissed the action in its totality in 2015 and upheld the decision of the Commission. In February 2016, Ellinikos Chrysos appealed before the CJEU, raising three pleas in law, namely failure of the General Court to state reasons as well as defective reasoning on the assessment of the real market value of the Cassandra mines and the value of the land, and incorrect valuation of the advantage arising from the tax exemption. It based its claims on criticism of the expert report used by the Commission, in particular of the circumstances under which the report was drawn up. According to the appellant, this led to an incorrect assessment of the value of the mines, on which the assessment of the value of the land and the subsequent tax advantage was based. The Court noted misreadings of the General Court’s ruling by the appellant, holding that the General Court has not failed to provide adequate reasons, with one exception. The Court upheld the part of the appeal regarding the complaint of Ellinikos Chrysos that the General Court had not responded to the company’s arguments criticising the suitability of the expert report. Nevertheless, the Court could not see how these arguments would disqualify the use of the expert report in assessing the advantage granted, as the reliability and objectivity of the report itself were not disputed. Further, the appellant did not show a manifest error (distortion of facts or evidence) in the appealed judgment. The Court read in between the lines of the appeal and held that Ellinikos Chrysos is essentially asking for a fresh assessment of the aid. In this regard, following settled case law, it reiterated that in state aid cases the Court can only apply procedural review and substantive review restricted to the external limits of discretion (e.g. manifest error or misuse of powers). It cannot substitute the expert opinion of the Commission that determines the value of the aid through complex economic assessments (Article 108 TFEU). Furthermore, an appeal can only be brought on points of law (Article 256 TFEU and Article 58 (1) of the Statute of the CJEU). Hence, the Court set aside the judgment of the General Court regarding its inadequate response to the criticism of the expert report, and dismissed the appeal as to the remainder. It confirmed the decision of the Commission and ordered Ellinikos Chrysos to pay back the illegal state aid of € 15.34 million plus interest. It has been reported that Ellinikos Chrysos had in fact already since 2013 paid back the total debt to the Greek state amounting to € 21.6 million, which includes interest and legal costs. Thus, the decision of the CJEU would determine whether the Greek state would have to pay back the amount to the company if the appeal were granted. The mining activities in Halkidiki however are far from over, as only five days after the issue of the CJEU ruling, the Greek Ministry for Environment and Energy extended the legal permits of Ellinikos Chrysos for further mining activities, while the criminal charges against 21 residents of Ierissos are still pending before the Greek courts.